Grade 3 winner and champion sire Cactus Ridge will stand the 2014 season at Royal Vista Ranches. WAYNE, OK�DECEMBER 31, 2013�Grade 3 winner and multiple champion sire Cactus Ridge (TB) will join the Royal Vista Ranches, near Wayne, Oklahoma, stallion roster in 2014. His fee has been set at $5,000 with special consideration to Quarter Horse mares. "We are very excited to have this outstanding Thoroughbred stallion join our roster for the upcoming breeding season," Royal Vista Ranches Farm Manger Laura Wipf-Erickson said. "He has sired a sprint champion and his connection to leading Quarter Horses through his sire should make him a great out-cross." Owned by Toby Keith's Dream Walkin' Farms, Cactus Ridge has sired nine crops to race, 52 stakes horses, 249 winners with earnings of $17.5 million and average earnings per starter of nearly $55,000. Among his top performers are Grade 1 winner Hot Cha Cha (6 wins, $998,552), Champion Sprinter and Champion 3-Year-Old Colt Hollywood Hit (9 wins, $622,156), two-time Champion Peyote Patty (11 wins, $538,343), G1 placed Supreme Summit (3 wins, $498,080), stakes winner Sharp Secretary (7 wins, $346,012), etc. Cactus Ridge won three of four starts at 2, earning $187,850, including the Grade 3 Arlington-Washington Futurity, James C. Ellis Juvenile Stakes and Canterbury Park Juvenile Stakes. A son of leading sire Hennessy, who is also the sire of G1 winner and leading Quarter Horse sire Check Him Out, Cactus Ridge is out of G1 placed Lycius mare Double Park ($57,392). He is a brother to stakes winner Sebastian County ($230,155), and half-brother to stakes winner and multiple stakes producer Harriett Lane ($163,500). 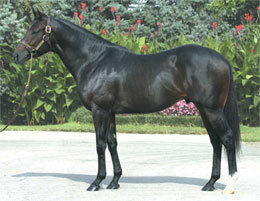 The second dam is a multiple stakes producing daughter of leading sire Danzig. For additional information or breeding contracts call Laura at 405-449-7575.